You might remember a few weeks back we had a call to a challenge - to help us launch our new range of patterned papers and rubons. This is our very own Been There Done That range, and its launch celebrates everything Australian. Each line of six papers covers a different state of Australia, with it's own colour story and themed titles, place names and topics. 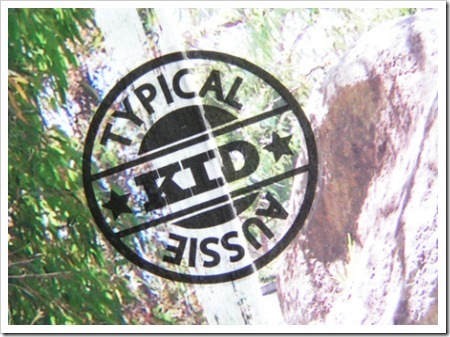 Designed by Australians, for Australians, that are even printed in Australia. 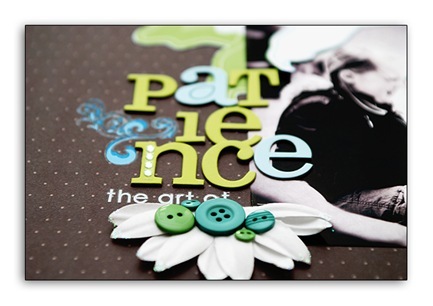 This is a range of contemporary themed quality papers that are neither tacky, cutesy or too busy. And they are double sided so that you can turn them over and have the versatility of quietly simple but beautiful background papers that are happy to do just that - sit in the background and let your photos take centre stage. Anyway, we had an unbelievable response to our challenge and each day over the course of this next week we share with you the fruits of the labours of both our own design team and our impromptu design team - 32 of our readers who each received the full range of Been There Done That products to work with. Although each of them was assigned a particular state to work with, many of them didn't stop with just one. We have been blown away by the number and quality of the projects we have received. We would like to thank them all now - an egalitarian mix of published artists and unknown artists - and that's what we wanted - to showcase the multitude of ways you can use Been There Done That at every skill level. We begin today with the temperate greens and blues of Victoria. Grab a cuppa and enjoy. Ever have one of those moments when you see a pp and know immediately exactly how you'd like to use it? Well, this 'Common Health' pp by Been There Done That is one of 'those' papers and Donna knew just what to do! 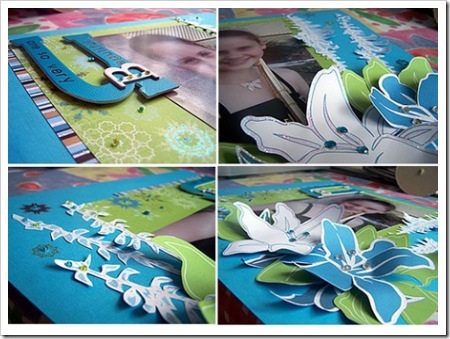 The design focus for this layout are these gorgeous green, white and blue flowers made richer by this lush brown background. 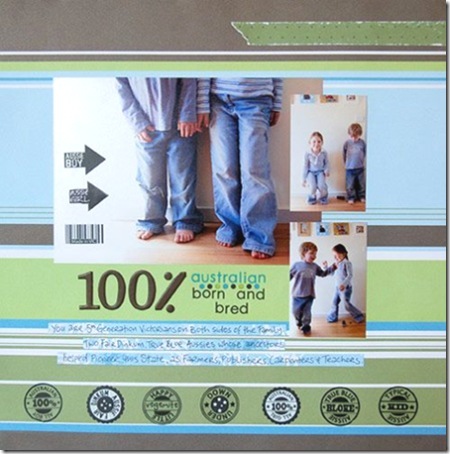 A few rubons complete the look and gently tell the world, that this is an Aussie Layout and one completely adorable Aussie KID! Green and blue is a timeless combination, and mixed with these aquas and browns these patterned papers are an irresistible earthy combination ideal for skies and countryside of any of the more temperate states. 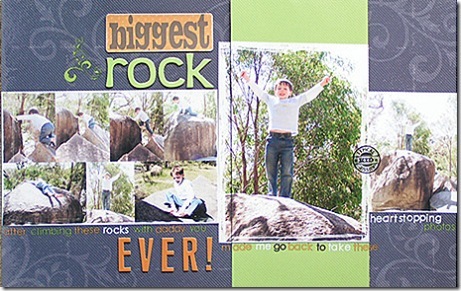 Suz has created this double 8.5x11" layout very simply, letting the papers and photos pretty much speak for themselves. 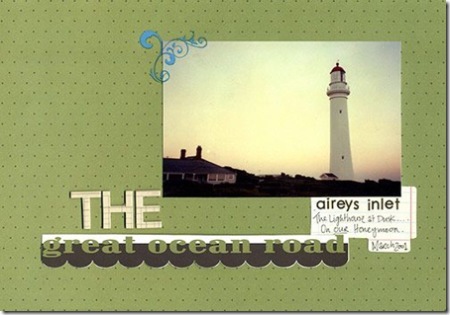 The word papers are extra versatile when you can find uses for them elsewhere as Suz has here, mounting on chipboard and sanding the edges, and the Scenic Route Paper Redmond chipboard in Mint is a perfect match for the greens in the papers. Responsible for the concept and design of these papers, we're pretty impressed that Cheryl was determined to find some time to actually use them on some of her own layouts! She has handcut the flower design and layered it as a simple but effective embellishment to complement this photo of herself and her two lively boys. The Heidi Swapp clear acrylic 'Remember' is the perfect accompaniment in the vertical space above. 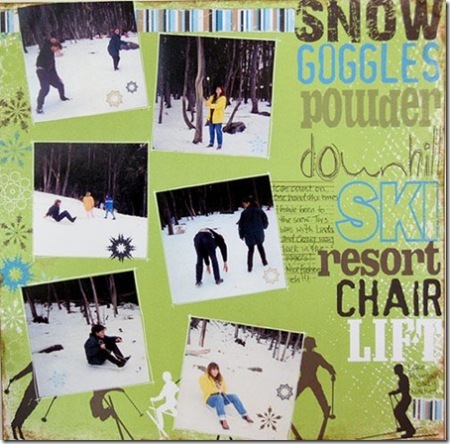 Carolyn Ondjaate: The kids' first ever snow trip was accompanied by a memory-cardless-camera much to my horror. In true scrapbooker style, I dragged them on another 3hour drive back to the snow for a second attempt at the perfect photo ten days later!! This layout was a pleasure to create. How did they know the colours in the ski papers were going to match my childrens' snow gear!? The rubons have been placed on one inch chip tiles and mounted over handcut papers for a dimensional and feature effect. The journalling is in a Basic Grey frame. 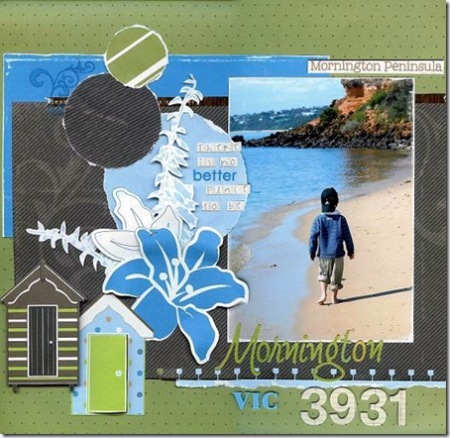 Dianna Sullivan says she just adored the colours in the Victorian range, and although it wasn't her 'assigned' state, she couldn't resist creating this gorgeous layout of her daughter. We're glad she did - it looks amazing. Jane Fitchett: The paper with the place names was the starting point for this one. Our honeymoon was spent travelling down the G.O.R., and I've never scrapped any photos. I had heaps of lighthouse photos, and this one just went perfectly with the with the soft dusk tones of the papers - only another 20 or so layouts to do to record the rest of our honeymoon! Jane Fitchett: This layout uses very recent photos, which i knew i wanted to scrap as soon as i took them, but wasnt sure how i was going to do it. Then when i received the BTDT gear and saw the Fair Dinkum rubons, i knew i had my subject. 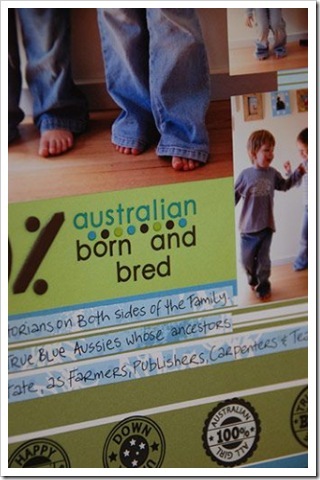 Our kids have the same time frame of ancestors living in Australia on both sides of the family- interestingly on both sides were publishers. On my side there were newspapermen from Koroit, and on the Fitchetts, they were the original owners of New Idea magazine!! Jane Fitchett: When i saw this paper i thought of these old photos of me, my sister and one of my brothers. Mucking around at the snow. Ive used the snowflake rubons from the vic pack, and the strip at the top (the stripey bit) is the reverse side on this paper. I like how when you cut off the bottom that has all the supplier details on it, you can turn it over and have a narrow but useable strip. Carole Janson: Here I cut the flowers out and curled them and 3D'ed them onto the layout with foam tape. 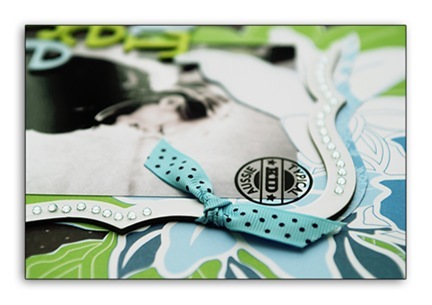 I adhered beads onto the layout using dimensional magic and embellished with Heidi Swapp gems. I love the colours of this paper - just gorgeous. 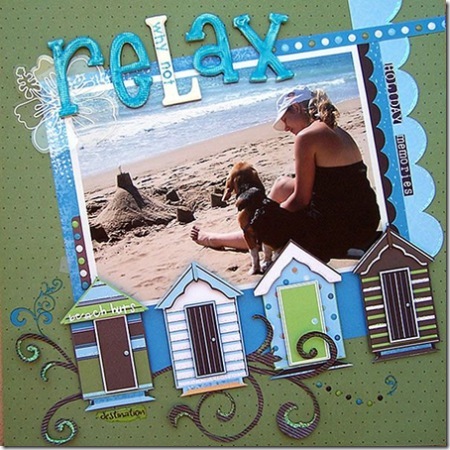 Carole Janson: I loved using the Victorian papers and rubons here - they are simply gorgeous. I cut out and 3D'ed the Huts from the patterned paper with foam tape and then used dimensional magic on the paper to give them more height. The alphas are Pressed Petals Chip Chatter Large Alpa which i embellished with a Heidi Swapp Hibiscus Silhouette. Cindy Couacaud: The snow paper from the Victorian range was perfect for this photo of my kids at the snow a few months back. I matted the photo and then mounted it onto corrugated cardboard to give it some dimension. I loved the alpha rubons - they're just such a handy size for snippets of journalling - even directly onto the photo - and they're easy to apply. I used the themed snow rubon on a metal ringed tag which echoes the paper design. Tamara Milborn: I've had these photos of Melbourne city for a couple of years, waiting to be scrapped, and this was the perfect opportunity! The blues and browns are a perfect match for the pictures of the urban landscape. 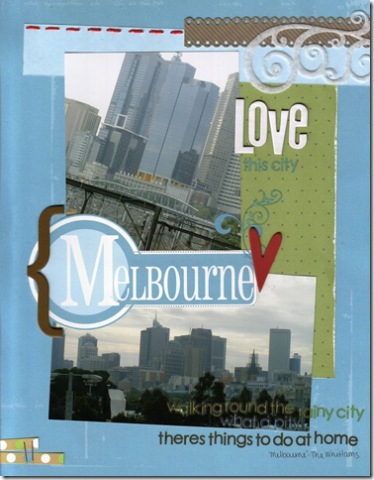 I used some lyrics from my favourite ode to my favourite city - 'Melbourne' by The Whitlams - for journalling in the gorgeous rubon letters. Tamara Milborn: The blues and browns, and subtle patterns on the reverse sides of these papers worked perfectly for this photo of my husband and our little boy. 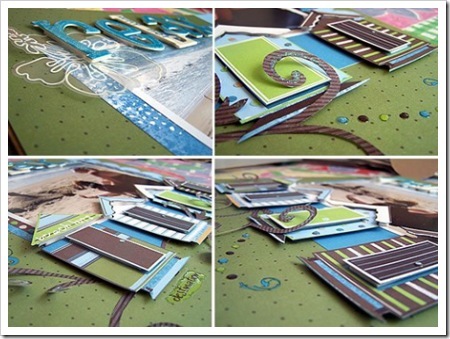 A handcut swirl of contrasting green lifts the layout and complements the green Heidi Swapp photo corner. Coordinating papers make it so easy to create a layout while keeping the focus on a favourite photo! Jody White: I was so pleased I got to use the Vic range. When I saw the colours of the papers, I knew that I had the perfect photo for the layout. I found the product really easy to work with, and I was able to express exactly how I felt about living on the Mornington Peninsula. 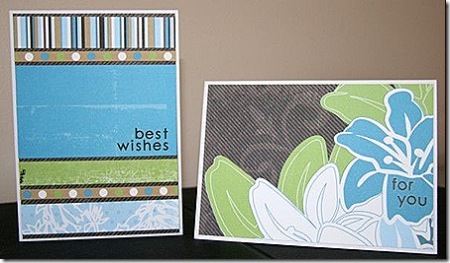 And last but not least we finish with a few great card ideas from our resident card queen Chris Millar. Chris put these together simply with some leftover scraps from the Victorian range. Chris has amazingly made some cards with papers from each state which we'll share with you each day. Come back tomorrow to check out the contrasts and vibrancy of the Top End with us.